A high level UN delegation, headed by Mr. Dereje Wordofa, UN Assistant Secretary General and UNFPA Deputy Executive Director, met with Eritrea’s senior officials. The delegation included Dr. Julitta Onabanjo, the UNFPA Regional Director for East and Southern Africa Region and Mr. Ramiz Alkbarov, UNFPA Policy and Strategic Division Head at the UN Headquarters. ERITV spoke to Mr. Dereje Wordofa. As this is your first visit, what is your impression about Eritrea? I am very impressed. I have seen the impact brought upon the peace agreement thanks to the efforts of H.E President of Eritrea, Isaias Afwerki and our own Prime Minister, Doctor Abiy Ahmed. The two leaders made a courageous decision which has a big impact in the horn. During my two-day work visit I had a chance to meet several government officials. I was introduced to national projects and I had a chance to look at national data especially for the education and health sectors. In Eritrea, I am impressed by major progresses in health and education. Child and maternal mortality, for example, have been reduced incredibly. This and such national undertakings show the hard work and commitment of the people and the leaders of the government. What is your opinion about the function of the UNFPA in Eritrea? The work of UNFPA is directed to work around the reduction of maternal mortality, maternal care, improvement of family planning, reducing harmful practices etc. I visited, in Eritrea, the Mendefera Referral Hospital as well as the Adi Quala Community Hospital where I saw outstanding work towards maternal and infant health. I saw how pregnant women are treated pre and after giving birth and also how the health centers respond to fistula cases. What is interesting about Eritrea is that the work is not conducted only through medical practices but also through psychological care. Giving birth at home is what leads many women to end up with fistula but here in Eritrea, thanks to the government’s effort to educate and make the society aware, the cases of fistula have minimized notably. What kind of cooperation do you foresee between UNFPA and the Ministry of Health? I have had useful conversation with government officials. We discussed the overall socio-political developments in the Horn of Africa and how that is bringing positive impacts for the countries. At the same time we discussed how to accelerate Eritrea’s developmental achievements because as I mentioned before Eritrea has made tremendous headways in the education and health sectors. Yet again there are miles to go. 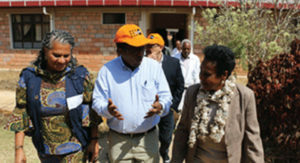 And UN, UNFPA included, are standing willful to work in cooperation with the Government and People of Eritrea. We have to bring more resources and accelerate our work. We expect longer travel permits for UN officials and workers now that security threats are less over the border. When I spoke to the Minister of National Development, Dr. Gherghis, he told me that Eritrea shouldn’t wait until 2030 to achieve the sustainable development goals. We agree with him hundred percent. Eritrea is a country which is resilient, endured tough challenges and yet managed to register impressive progress. Therefore, if we add momentum resources to what has been done I believe that together we can achieve the sustainable development goals well before its time. Mr. Dereje Wordofa, any final remarks? Yesterday I had the opportunity to meet a number of government officials and senior diplomatic representatives based in Asmara, and I was impressed by the keenness of the international community to work with the People and Government of Eritrea; to support Eritrea and its development plans even more at this point in time when the hopes and aspirations are increasing. I am also fascinated by the leaders in government such as the honorable Minister of Health, Ms. Amina Nur- Husein. Not only is she experienced but she also very passionate because she believes that it is indeed possible to change the health of Eritreans. With her leadership and passion many things have been registered in the health sector that can be seen in many parts of the country. I am most impressed by the professionals, mostly young men and women, who work in every referral and community health centers around the nation. They work not because they make wealth out of their profession but because they believe in the cause of national development. They wake up every morning to assist their people with what they have learned. For me as a development worker their stories were an inspiration. What I have been keen about through most part of my adult life was how to make changes and how to include people in poverty and in disadvantageous situations to live in prosperity. For me, this country is a country of possibility. We need to open up to much expanded cooperation schemes with Eritrea. We have a lot to learn from Eritrea. Eritrea has a lot to tell the world. So, as much as we show the example Eritrea has demonstrated in the past decades, we need to bring in resources and knowledge to accelerate Eritrea’s drive towards inclusive development. I am very much inspired and energized. When I go back to New York I will share the stories I heard and the photographs I took to show that Eritrea is on the right track. “ Eritrea is in a new dawn with the new dynamics of the Horn of Africa. Eritrea is a country that has had it difficult in the previous circumstances and, that, I think, was translated into national commitment to ensure the wellbeing of its people. I was here five years ago and even then was impressed by what I saw in terms of maternal health care. In Eastern-Southern Africa, Eritrea is one of the countries that were able to achieve a decrease in maternal and child mortality. When you listen to the leadership here you realize their interest to move faster towards national development trajectory, move faster to insure their people’s health and education, move faster to insure that the youth really advance and develop this country in terms of leadership and their engagement. I think that this is very encouraging, for me. I am glad to see UNFPA-Eritrea has been collaborating with the Government of Eritrea in achieving results ensuring maternal health, reducing fistula cases, empowering women to be healthy and productive. I am glad to see the collaboration between UNFPA and the Eritrean Government towards national goals. Coming here as the Regional Director, I go away with a rich experience of what can be done and with a real sense of humility and drive.